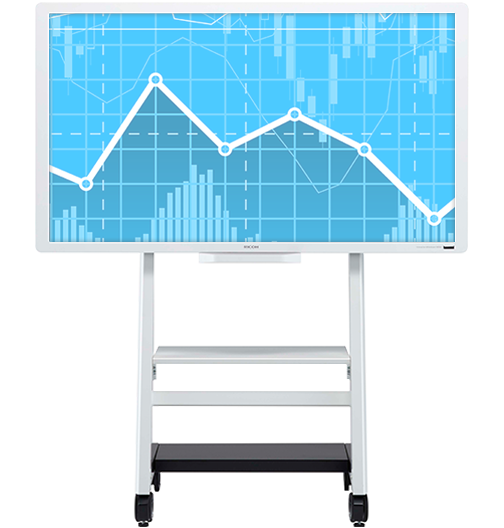 Give your audience something to look at - and something to do - with the RICOH D6500 Interactive Whiteboard. Connect your analog or digital video and audio devices and use it as a brilliant, standalone 65-inch LCD display. Or, connect it to your personal computer. With your own third-party interactive software, you can emulate mouse movements and mobile device controls on the IWB's touch panel to operate and modify applications on your PC or Mac. Don't keep your audience waiting for important information. Use the D6500 interactive digital whiteboard in Windows ®, Mac ® and Android ™ environments by connecting it via USB cable to your PC, tablet, smartphone, USB flash drive or other smart device. Within moments, you can present your messages while interacting with your audience and the whiteboard - all without adding software, making calibrations or requesting IT support. There shouldn't be any limits when sharing big ideas. We created the D6500 digital whiteboard to work directly with the interactive software on your computer to showcase information on a larger, more brilliant display. For example, if your software allows you to add shapes, notes and other markings to CAD drawings, you can make those changes on the large display, too. Zoom in on specific blueprints. Scroll between designs. Emulate mouse movements on the big screen so everybody can see even the finest details with ease. Make sure your audience can see accurate details every time by presenting with 1920x1020 dpi resolution. With the brighter colors, subtle shading and crisp text found only with high-definition displays, every member of your audience - from those sitting in the front row to those standing in the back of the room - can see every detail of your drawings, schematics, blueprints, spreadsheets and more with incredible clarity. Get more feedback from more people by connecting the D6500 interactive whiteboard with other Ricoh devices. Set up your own videoconference by pairing it with a Ricoh video conferencing system and using the picture-in-picture feature to share your presentation remotely. Or combine it with a Ricoh projector to present to larger audiences in auditoriums, conference rooms and other locations without compromising image quality.